So, this weekend was the monthly grocery run. I hit Dominicks roughly once a month to stock up on things like tomato sauce, Spam, cereal and frozen pizzas. About every other month, I need kitty litter. I used to be brand loyal. It was Fresh Step and nothing else. The girls like it. I would buy it even if something else was dollars cheaper. They had a loyalty program that had some great stuff in it. But as I went from 5 cats down to 2, the things you could get in the loyalty program went from mats and dishes and climbing poles to magazine subscriptions and video rentals, things I have no interest in. And with finances being what they are, I had to take a look at how I spent my pennies. 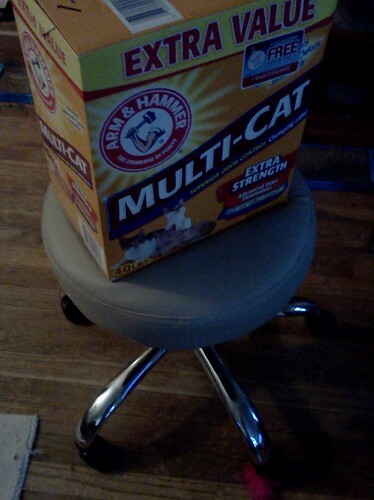 Arm & Hammer makes very good kitty litter. As long as I don't buy the smelly scented version, the girls are happy with it too. The added bonus is that, when I need it, it's usually on sale for dollars less than Fresh Step. Why, exactly, am I holding on to brand loyalty in the face of a $5 price differential? Hence, we have switched. I looked at what I can use my accumulated points on as a Fresh Step loyalty member and I'd have to buy 3 more boxes to get something the girls might use, and the emphasis is on "might". You know, I can donate the points to shelters in New York affected by Hurricane Sandy. I think that's the best use of points. But value only goes so far. Compared to where I was last year at this time, I can lift 80% more things. I had to put a box of litter on a rug last year and drag it to the back room where the boxes are because the litter was too heavy for me. Getting it in the house was an adventure and I thought I would hurt myself. This year, that same box is easy to carry. So, I looked over my selection in the store for litter and the above box caught my eye. It was 40 cents a pound instead of 50. That's a really good deal. I hoisted the box onto the bottom of the cart, noticing that this was a bit heavier than I remembered other boxes being. At the check out, it was quite the adventure to get it out from under the cart and lifted up onto the line. The gal who rug it up commented on how heavy it was. I got it into the car and then had to take it from the car to the deck and then deck to the kitchen. No way was I going to be able to get this down the hall and into the room with the boxes. It was then and only then, that I noticed. It's 40 POUNDS of cat litter. No wonder it was heavy. I probably shouldn't have been lugging it around but my ignorance was a help. What to do now? I put away all the groceries as I contemplated the job of getting 40 pounds to the back room. Well, there's the rug trick. I know that works. Then it hit me. That stool. I got the litter onto the stool and rolled the whole thing back to the room. I ripped off the top of the box while it was on the stool and moved it to the floor where it sits next to the litter boxes for easy scooping. And to think I was going to get rid of that stool. Still, while this was a fantastic buy and it will last us for some weeks, I'm wondering if it really is worth the value when I have to struggle to carry it? It's one thing when it's not winter but I don't think I would want to lug that over icy and snow covered ground to get it in the house. What I take away from this experience is that I have to read the product size before deciding if it's a good value. If I can't really carry it, it's better to pay more. April can identify with this. I usually get 40# pails at Sam's club. When we get them home I dump half into another pail so she can move them around easier.